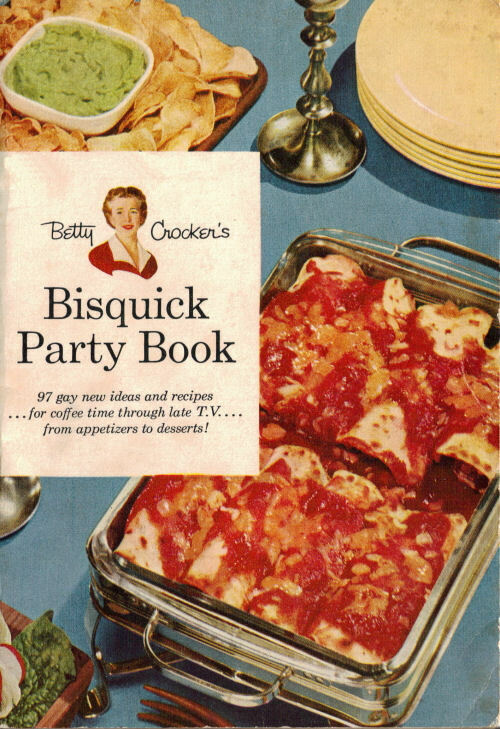 Here are pages 10 and 11 of the vintage cookbook: Betty Crocker’s Bisquick Party Book that was published in 1957 by General Mills. When you hadn’t planned a party, but you have one, here’s an elegant way out, built around ingredients you’re likely to have on hand. 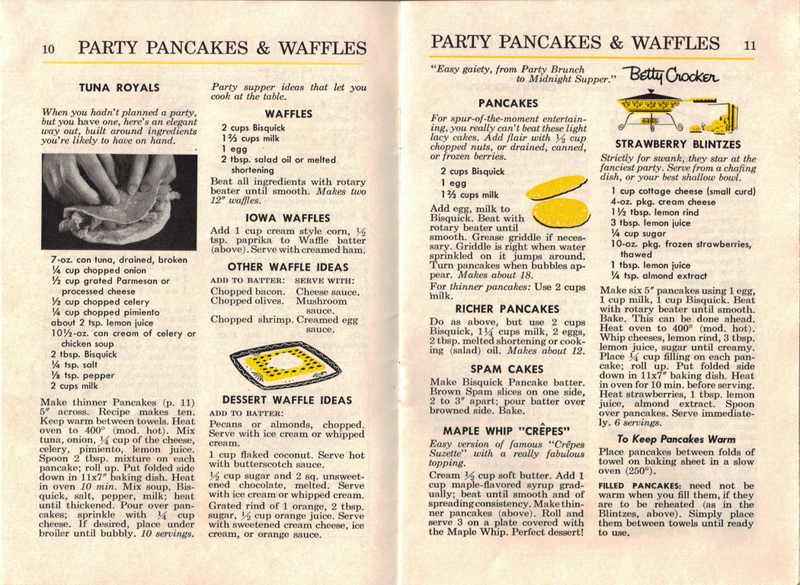 Make thinner Pancakes (p. 11) 5″ across. Recipe makes ten. Keep warm between towels. Heat oven to 400° (mod. hot). Mix tuna, onion, 1/4 cup of the cheese, celery, pimiento, lemon juice. Spoon 2 tbsp. mixture on each pancake; roll up. Put folded side down in 11×7″ baking dish. Heat in oven 10 min. Mix soup, Bisquick, salt, pepper, milk; heat until thickened. Pour over pancakes; sprinkle with 1/4 cup cheese. If desired, place under broiler until bubbly. 10 servings. Party supper ideas that let you cook at the table. Beat all ingredients with rotary beater until smooth. Makes two 12″ waffles. Add 1 cup cream style corn, 1/2 tsp. paprika to Waffle batter (above). 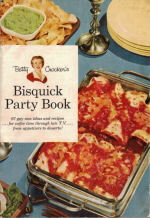 Serve with creamed ham. Chopped shrimp. Creamed egg sauce. Pecans or almonds, chopped. Serve with ice cream or whipped cream. 1 cup flaked coconut. Serve hot with butterscotch sauce. 1/2 cup sugar and 2 sq. unsweetened chocolate, melted. Serve with ice cream or whipped cream. Grated rind of 1 orange, 2 tbsp. sugar, 1/2 cup orange juice. Serve with sweetened cream cheese, ice cream, or orange sauce. For spur-of-the-moment entertaining, you really can’t beat these light lacy cakes. Add flair with 1/2 cup chopped nuts, or drained, canned, or frozen berries. Add egg, milk to Bisquick. Beat with rotary beater until smooth. Grease griddle if necessary. Griddle is right when water sprinkled on it jumps around. Turn pancakes when bubbles appear. Makes about 18. For thinner pancakes: Use 2 cups milk. Do as above, but use 2 cups Bisquick, 1 1/4 cups milk, 2 eggs, 2 tbsp. melted shortening or cooking (salad) oil. Makes about 12. Make Bisquick Pancake batter. Brown Spam slices on one side, 2 to 3″ apart; pour batter over browned side. Bake. Easy version of famous “Crepes Suzette” with a really fabulous topping. Cream 1/2 cup soft butter. Add 1 cup maple-flavored syrup gradually; beat until smooth and of spreading consistency. 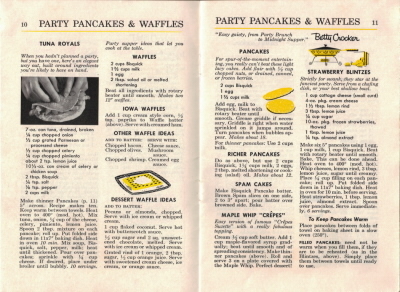 Make thinner pancakes (above). Roll and serve 3 on a plate covered with the Maple Whip. Perfect dessert! Strictly for swank, they star at the fanciest party. Serve from a chafing dish, or your best shallow bowl. Make six 5″ pancakes using 1 egg, 1 cup milk, 1 cup Bisquick. Beat with rotary beater until smooth. Bake. This can be done ahead. Heat oven to 400° (mod. hot). Whip cheeses, lemon rind, 3 tbsp. lemon juice, sugar until creamy. Place 1/4 cup filling on each pancake; roll up. Put folded side down in 11×7″ baking dish. Heat in oven for 10 min. before serving. Heat strawberries, 1 tbsp. lemon juice, almond extract. Spoon over pancakes. Serve immediately. 6 servings. Place pancakes between folds of towel on baking sheet in a slow oven (250°). FILLED PANCAKES: need not be warm when you fill them, if they are to be reheated (as in the Blintzes, above). Simply place them between towels until ready to use.